As a local firm of financial advisers providing financial advice in Lichfield and throughout the area we have many local connections. Some are business, but others are family connections. Nic Whittaker is one of our financial advisers and his nephew Finley is a defender in the Under 11s team at Norton Canes Football Club. The club were looking for someone to step-in and sponsor their home kit. Four Oaks Financial Services was only too happy to help. 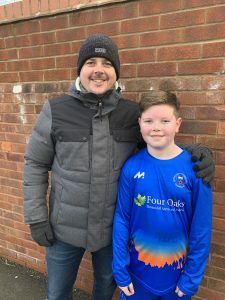 Finley has been in the team for three years, and Uncle Nic goes as often as he can to support him on a Sunday morning. It is a big commitment to be part of the team as they train on Wednesday and Saturday as well as playing matches on Sundays. By clicking on the above link, you are now departing from the regulatory site Four Oaks Financial Services Limited. Neither Four Oaks Financial Services Limited nor Intrinsic are responsible for the accuracy of the information contained within the site.